Early diagnosis of hypertension leads to avoidance or delaying the effects of hypertension on the body. For your information blood pressure readings are usually given as two numbers -- for example, 120 over 80 (written as 120/80 mmHg). One or both of these numbers can be too high. The top number is called the systolic blood pressure, and the bottom number is called the diastolic blood pressure. Normal blood pressure is when your blood pressure is lower than 120/80 mmHg most of the time. High blood pressure (hypertension) is when your blood pressure is 140/90 mmHg or above most of the time. If your blood pressure numbers are 120/80 or higher, but below 140/90, it is called pre-hypertension. 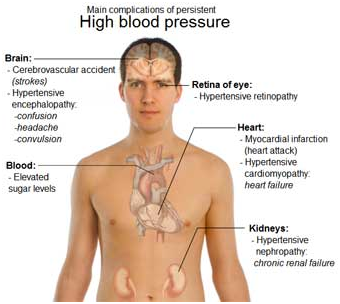 If you have pre-hypertension, you are more likely to develop high blood pressure. (2) However, for diabetic and chronic kidney disease patients, the normal blood pressure should not cross 130/80 mmHg. Hypertension itself usually has no signs or symptoms. Rarely, headaches may occur. You can have hypertension for years without knowing it. During this time, the condition can damage your heart, blood vessels, kidneys, and other parts of your body. 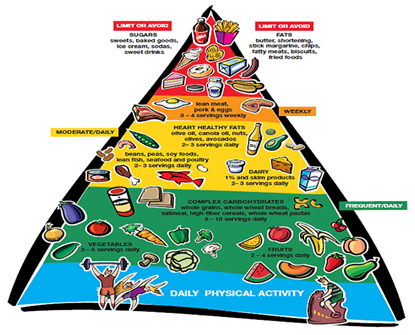 Eat a heart-healthy diet, including fibres, and drink plenty of water. Hypertension is a chronic life-long condition. Do not forget to take medicines if your doctor has prescribed medicines to control the blood pressure. Ask your doctor for the side effects of the medicines and signs and symptoms to look out for. Exercise regularly - at least 30 minutes of aerobic exercise a day. Find an exercise buddy. If you smoke, quit - find a program that will help you stop. Limit how much alcohol you drink. Try to stop it altogether. Reduce stress - try to avoid things that cause you stress. You can also try meditation or yoga. The heart to get larger or weaker, which may lead to heart failure. Aneurysms to form in blood vessels. An aneurysm is an abnormal bulge in the wall of an artery. Common spots for aneurysms are the main artery that carries blood from the heart to the body; the arteries in the brain, legs, and intestines; and the artery leading to the spleen. Blood vessels in the kidneys to narrow. This may cause kidney failure. Adults over 18 years should have their blood pressure checked regularly like once every year or as doctor consults. Lifestyle changes may help control your blood pressure. Follow your health care provider's recommendations to modify, treat, or control possible causes of high blood pressure. Adults should do at least 150 minutes (2 hours and 30 minutes) of moderate-intensity aerobic activity (i.e. cycling or fast walking) every week. For it to count, the activity should make you feel warm and slightly out of breath. The normal heart rate range 60-100 beats per minute. Aim to stay within a target heart rate zone that is 55 to 70 percent of your maximum heart rate to exercise moderately. Calculate your max heart rate by subtracting your age from 220. Someone who is overweight may only have to walk up a slope to get this feeling. 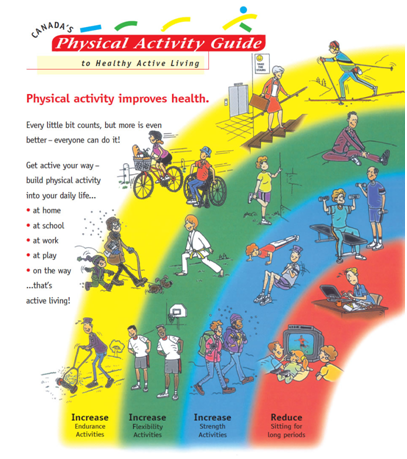 Physical activity can include anything from sport to walking and gardening. Stand upright and carry lightweight dumbbells by your sides. March continuously on the spot, keeping your knees low and avoid swinging your arms. Do this continuously for 30 to 60 seconds before taking a short break. Do the exercise four to six times. March on the spot, with your knees lifted high. To do so, flex your right hip and left arm at the same time till the knee and elbow are each bent at 90 degrees. Return to the starting position and repeat with the left hip and right arm. Do this continuously. Breathe normally and do not hold your breath when lifting the weights. Depending on your fitness level, start with 30 to 60 seconds for each set of marching. 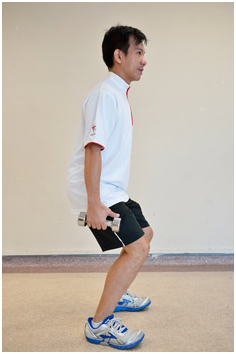 Then, slow down by marching on the spot with dumbbells by your side for another 30 to 60 seconds. 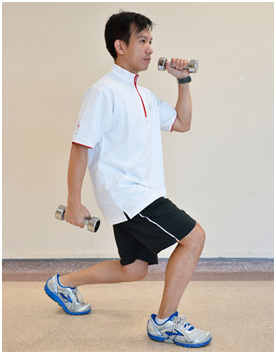 Carrying dumbbells at your sides, march continuously on the spot for 30 to 60 seconds. Then stop and do a quarter squat, with your legs shoulder-width apart and your arms by the side. Stand upright again and flex both arms upwards to perform bicep curls. Breathe normally while doing this exercise and do not hold your breath when lifting the weights. Then return both arms to your sides. Depending on your fitness level, start with 10 repetitions and progress to 20. Then march on the spot, holding the dumbbells by your sides, for 30 to 60 seconds. 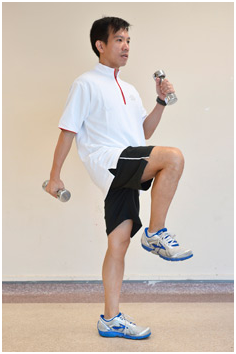 Take one step forward with your right leg and lower your body slightly. 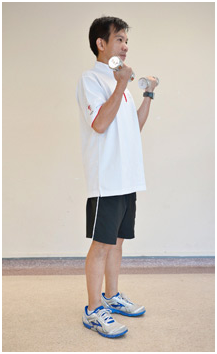 At the same time, flex the left elbow upwards fully till the dumbbell is parallel to the floor. Return to the starting position, lowering the left arm back to the side. Repeat with the other leg and arm. Breathe normally while doing the exercise. Do not hold your breath when lifting the weights. Depending on your fitness level, start with 10 repetitions and progress to 20 repetitions on each leg. 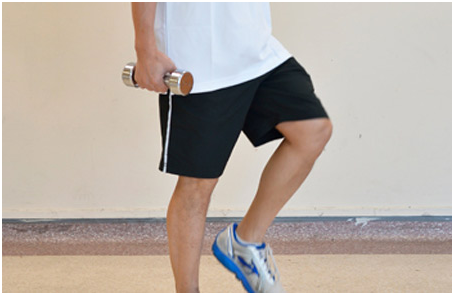 Do the whole sequence of 10 to 20 repetitions on each leg and marching on the spot four to six times. Tobacco and Smoking Quit! Tobacco and second-hand smoke as it can lead to other cardiovascular diseases (CVD). Call - the Quit Line, 1800-22-77-87. 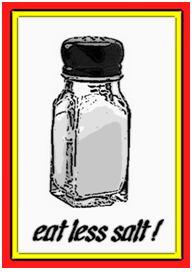 Avoid Unhealthy Fats such as Cholesterol, Saturated and Trans Fat. Stay away from egg yolks, cream, butter, ghee, coconut, deep fried items, whole milk, dalda, vanaspati. No Carbonated, Caffeinated and Alcoholic beverages.